Be sure you're buying a chuck steak, cut thick, for this recipe; the cut of beef is important for such a simple recipe. 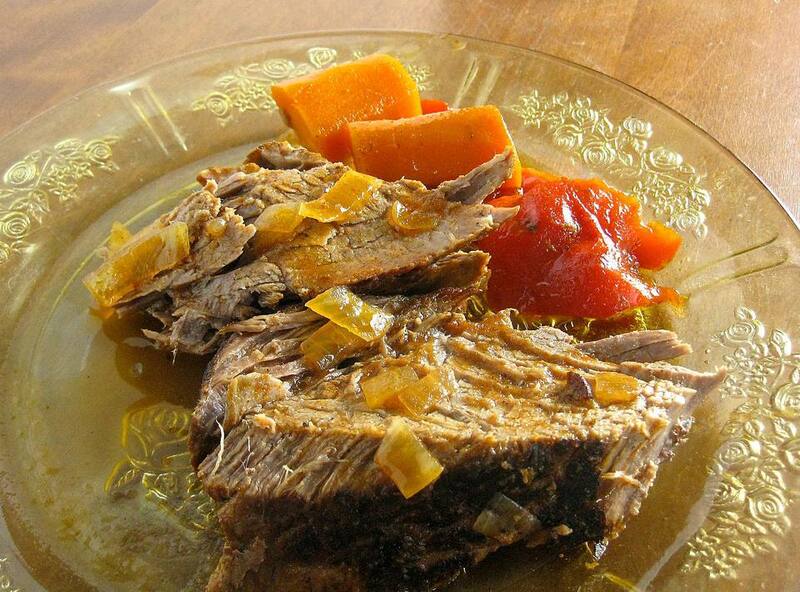 Easiest Pot Roast is easy, but you need good ingredients, especially so because this is a two-ingredient recipe. You can, of course, add other ingredients to this easy recipe. I would add lots of garlic, thinly sliced, and some potatoes and carrots to make this a ​one dish meal. After all, as long as you are using the oven for such a long time period, why not prepare the whole meal at the same time? I would also add some herbs to this recipe. Some dried marjoram would be wonderful; marjoram is delicious with beef. Or you could add some dried Italian seasoning, or dried oregano and thyme. Whatever changes you make, be sure to write them down so you can reproduce this dish the next time you get a hankering for it. All you need to serve with this dish is a simple green salad tossed with sliced mushrooms, and a glass of red wine. The cut of meat is most important in this recipe. Make sure you are buying a chuck steak, cut very thick. Ask the butcher if you don't see it in the meat counter. Place the onions in the roasting pan. Place the steak over the onions and season to taste with salt and pepper. Add 1/2 cup water to the bottom of the pan. Cover the pan tightly with foil and bake in a 300°F oven for 4 to 5 hours. That's it! The roast should be very tender and falling apart when it is done.